Presenting four little boys, two named James, one named Roy, and one named Charles, each going to get their portrait made at five different Georgia photographers’ studios. The photographers running those studios were D. J. Ryan, R. J. Deane, L. S. Hill & Co., Goodloe, and J. Usher, Jr. One of these little fellows was taken (possibly dragged) to two different Macon photographers, within two years. Most of the portrait images in my collection are of unidentified persons, but all four of these boys are named. There may be someone out there who is related to one of these funny little fellows. I say “funny” because not one of them seemed to enjoy posing for the photographer, so the expressions are priceless! I haven’t researched these boys, but in one case a colleague in Augusta shared some interesting information with me about one of them. It is hard not to research each one of these boys, but my main concern is the photographers. If you have information or genealogy that touches on one of these boys’ names, let me hear from you. I’d love to know more. Let’s begin with Charles, who has the more unusual middle name of Baner (a family surname?) and a memorable surname, so he’s Charles Baner Bussell. 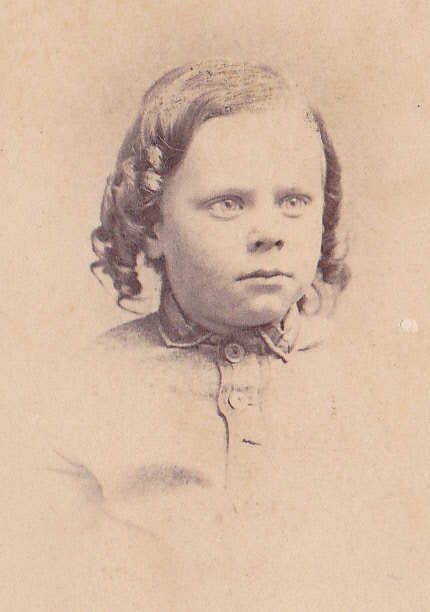 Little Charles visited the photography studio of Savannah’s D. J. Ryan in February 1869. Can you see why I’ve nicknamed him “Nelson”? He reminds me of the bad-boy character whose name is Nelson in televisions long-running The Simpsons. Charles seems so unhappy about being there at the photographers’ studio! Here’s a detail of that face. Did mom use a curling iron to make those ringlets? Below is a detail of D.J. Ryan’s backmark on this carte. 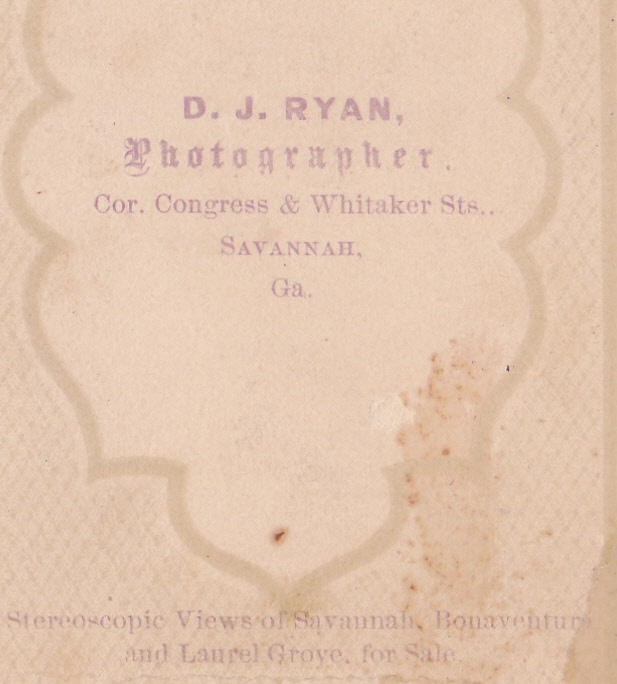 Savannah, Georgia photographer Daniel J. Ryan was quite the entrepreneur, note that in addition to making photos, he sold Stereoscopic Views of Savannah, Bonaventure, and Laurel Grove. This is an early photograph by Ryan, he only began working in Savannah in 1867, and I have not found any advertisements earlier than November of that year. He began advertising as a dealer in photographic apparatus, chemicals, etc. in 1871. By 1872 he was part of the E. & H. T. Anthony network of supply sellers, and his advertisements were published in their periodicals and catalogs. Below is his advertisement from the 1882 Savannah city directory. By then he was known primarily as a producer of stereo views and a dealer in photographic stock. 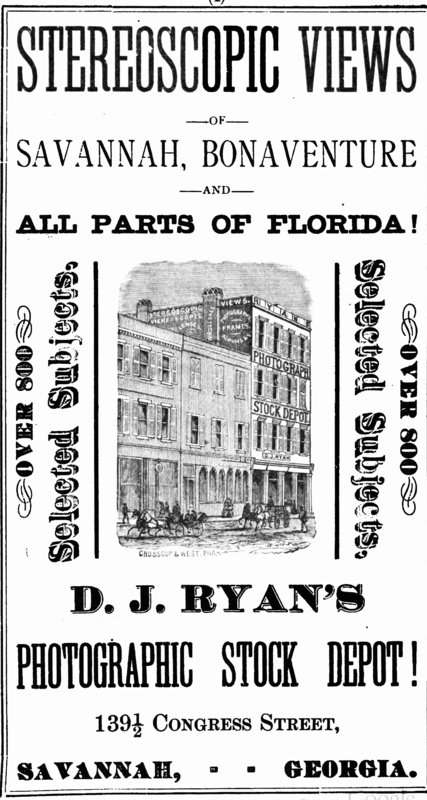 D. J. Ryan left Savannah about 1886, worked a few years in Illinois, and by 1893 had moved out to Denver Colorado. Although he tried to keep working as a photographer, he died penniless in March 1908, and is buried there in Riverside Cemetery. After his death, Denver’s local photographers put together a fund to place Ryan’s widow, Clara, into the “Old Ladies Home” there. 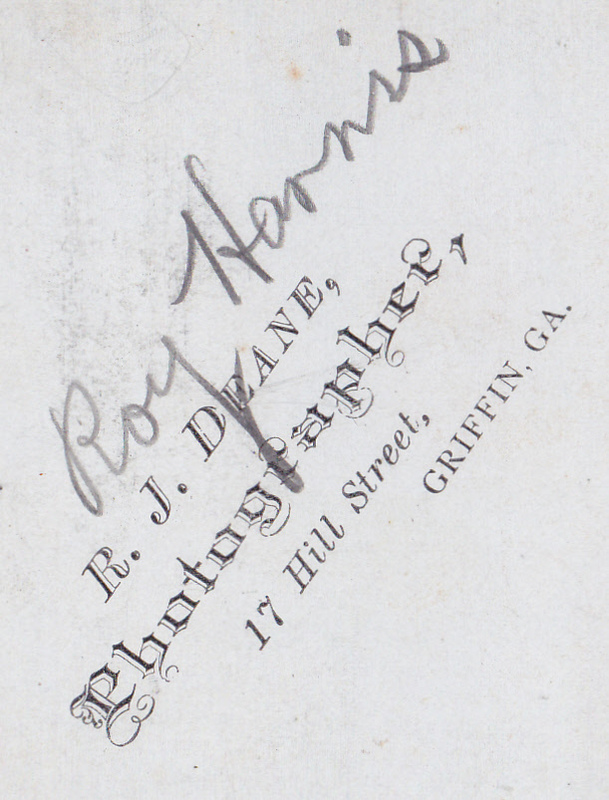 Richard J. Deane was a son of Griffin photographer H. L. Deane and a brother of photographer George P. Deane. He began working in his father’s photo studio when he was about seventeen years old. He was working on his own by the time Roy Harris came to his studio and he (or someone in his employ) produced this carte in about 1875. By 1880 Richard J. was the remaining Deane still working in photography in Griffin, but by about 1890 he left that business and got into another. He began a new career as the owner of a books and stationery store. I love the dressy fur-trimmed outfit, and the hat he holds – he is truly dressed for the photographer! Note the painted background, the faux grass on which his leather boots rest, and the nice “silver chalice” prop on the table. This Deane studio portrait has been very nicely done, was very well processed, and is still a beauty. 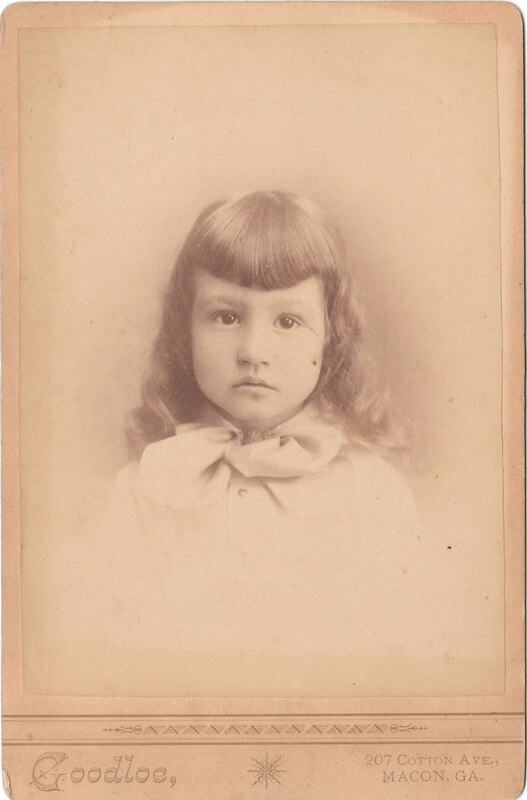 L. S. Hill, who was a Macon carpenter in 1880, worked for Macon photographer T. B. Blackshear from shortly after 1880, until he bought the deceased J. A. Pugh’s photo studio from Blackshear in September 1887. He “inherited” all the late photographer’s negatives, which he offered to reproduce for interested parties. L. S. Hill & Co. was actually made up of photographer Leonard S. Hill and artist L. R. Longhurst (I eventually will find their other employees). Lawrence R. Longhurst was also a former Blackshear assistant. Hill and Longhurst formed the new company together before 1890. Longhurst’s name is seen in the back mark above (at the beginning of this post) within camera circle, around the bottom . You can barely see it now. They often advertised as “Artists & Photographers” but Longhurst was the the artist of the two, a retoucher and colorist, and Hill was the photographer. It is Hill who was often reported by the Macon newspaper to be out taking pictures of this and that. Hill & Co. made this cabinet card of James N. Dill in 1893, which we know because someone wrote it across the photographers’ front mark. 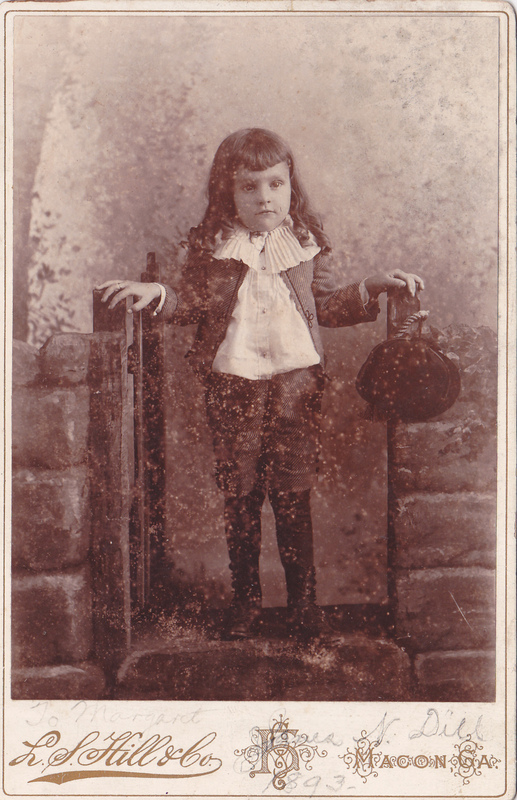 This image is not in great condition, but here is a closeup of Little James’ suit of “velvet,” with that amazing collar. He, like Charles and Roy, looks very well dressed by mom for his visit to the photographer! And once again, the ringlets and a rather stoic facial expression. But what is that “purse” thing hanging at the right? Any guesses? I am baffled by this thing. Longhurst was with Blackshear about ten years and with L.S. Hill & Co. about twenty years. When their company was sold in 1909, he retired to Nashville to be near his physician son. Hill also had a son who was a doctor, and by 1910 he and his wife moved to Anniston, Alabama to be near him. They moved back to Macon in 1915. Hill was classified by the census taker as a photographer as late as 1920, but I do not believe he was really working as one. Hill remained in Macon until his death in 1932. 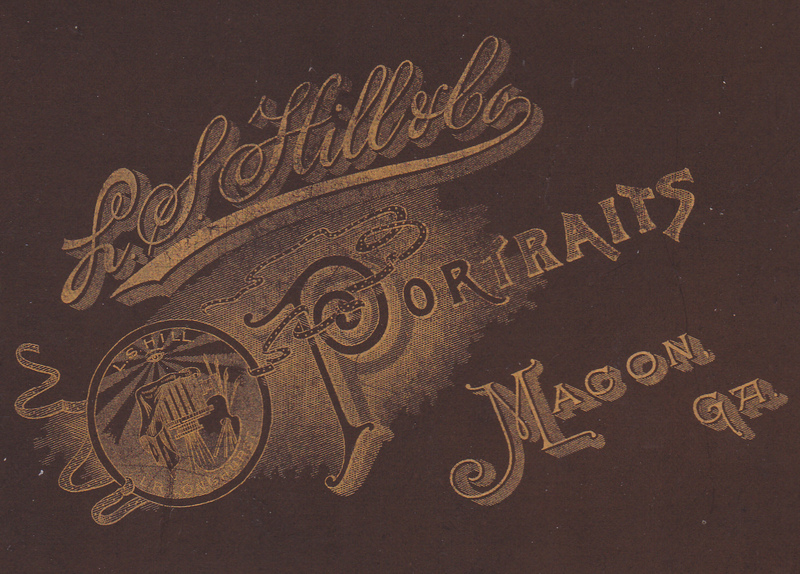 A year after Hill & Co. did their portrait of James Dill, another Macon photographer named Goodloe made one of him. This 1894 photo is very different from the one taken in 1893, but James does not look any happier this time than he did the last time, and possibly less so! He’s still in curls, although not ringlets. I am not positive yet , but I believe this is photographer W. H. Goodloe, who was a partner in Goodloe & Stram, who were briefly documented working in Macon in 1888-1889. Photographer W. Goodloe worked in Thomasville (1886-1887), and Valdosta (with a partner as Goodloe & Cameron, 1887-1889). He also paid tax as a photographer both in Brooks County, probably Quitman, and in Glynn County, probably Brunswick, in 1890. It is logical that he would have worked in a bigger city like Macon sometime in the 1890s. The only one of these little boys I know anything about is named James Horton Mathewson, an Augusta boy. He was photographed by John Usher, Jr. between 1896 and 1898. I am able to narrow the date of James’s visit to Usher’s because Usher had left his studio to work with other photographers, then reopened his own studio at a new address, 702 Broad St., in May 1896. 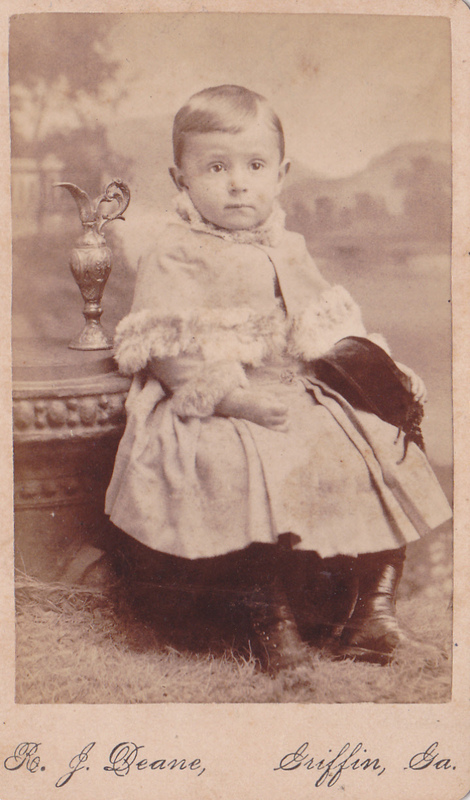 He was out of the photo business by October 1898 when data for the 1899 city directory was collected. It is no wonder Usher decided to quit, he was born in 1831 in Edgefield, South Carolina, and he would have been nearing seventy. 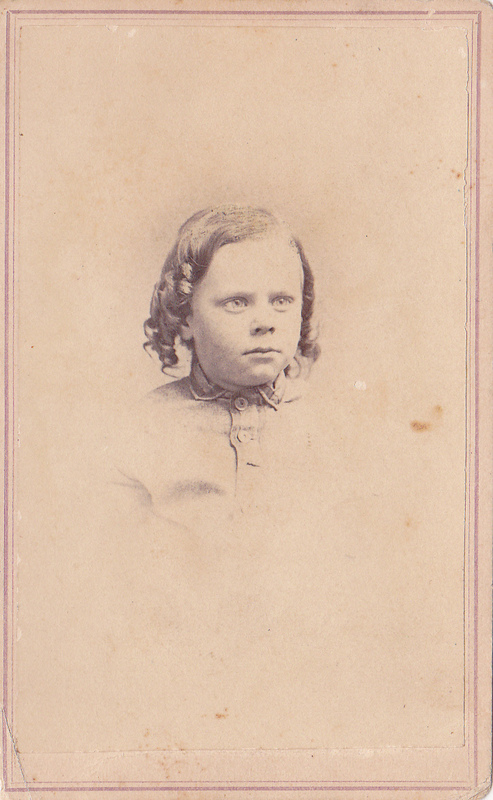 John Usher had a long career as a photographer, starting in 1853 when he was associated with Isaac Tucker in South Carolina, St. Louis, Mobile Alabama, and Augusta, Georgia. Usher served in the Confederate Army, then resumed work as an Augusta photographer, periodically associating himself with various other Augusta photographers. He died in 1913, at the age of 82. There are some wonderful images of his to see online, including many of his stereo views. Joe M. Lee’s Augusta and Summerville (Dover, NH: Arcadia, 2000) is another good source that includes many Usher images. Usher is another photographer who deserves his own post, better yet an article or book. I depend on Joe Lee, an expert in Augusta photographers, to do that. 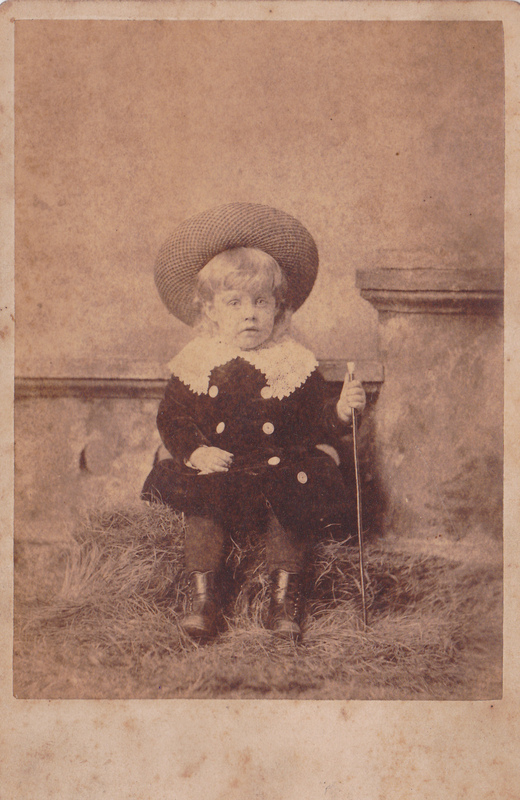 Here we have the last little boy, James Horton Mathewson, who is another one very well dressed for the photographer. I love the “hay” he sits on, the broad hat, and the little cane! But here is an interesting tidbit shared with me by my colleague Joe. This little boy is the young step-brother of Atlanta photojournalist Tracy B. Mathewson. 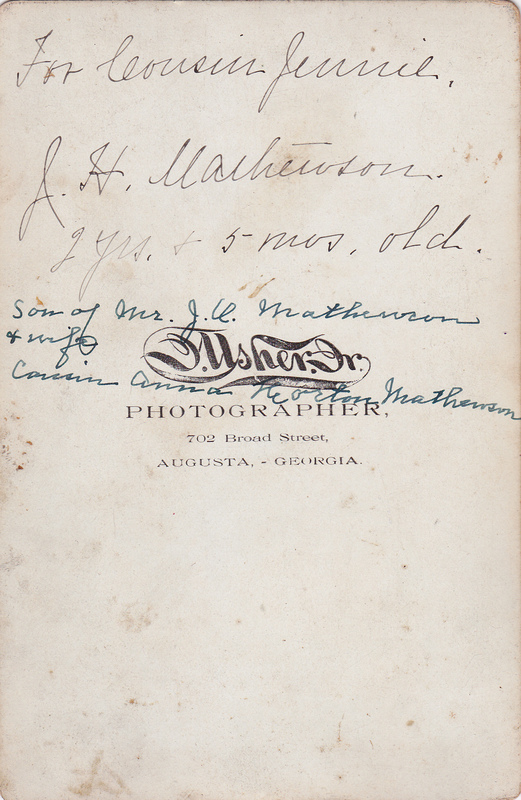 Tracy Mathewson was still in Augusta in 1900, working as “bicycle merchant,” but by 1910 he was in Atlanta working as a photographer. He worked as a staff photographer for both the Atlanta Georgian and the Atlanta Constitution, and he began working in motion picture film as early as 1918. He worked all over the world making still and moving pictures of many celebrities and events. He was noted especially for his sports photographs. Mathewson remained connected to news agencies into his fifties, and he died in 1957. I hope you’ve enjoyed this brief rundown of the four Georgia boys’ visits to five Georgia photographers. I had fun with it. So much to tell, so little time. If you have information to share regarding these boys, or a mistake you see, do not hesitate to contact me. Per usual, Happy Hunting! © E. Lee Eltzroth and Hunting & Gathering, 2013. Unauthorized use and/or duplication of this material without express and written permission from this blog’s author is strictly prohibited. The piece can be re-blogged, and excerpts and links may be used, provided that full and clear credit is given to E. Lee Eltzroth and Hunting & Gathering, with appropriate and specific direction to the original content. Thanks, Frances, I’ll check that out. Certainly the first I’ve seen in a photo, but I’ve not been looking at boys’ clothing in particular. I have several books on clothing I’ll take a look at. My first thought was similar to Frances’. I thought it was a traveler’s satchel as James appears to be “arriving” at someone’s gate. Yes, you two are onto something, and I need to brush up on my knowledge of boys’ clothing! I ran across your article while researching a family photo. I recently inherited boxes of old family photos from my beloved grandmother who is in end stage Alzheimer’s. One of these photos is of my great great grandfather & was done by L.S. Hill & Co. around 1890 on the same card and with the same inscription at the one in your article. It’s condition is excellent. I’d love to learn more. I will be in touch, I think I can tell you a bit more about Hill and his work! 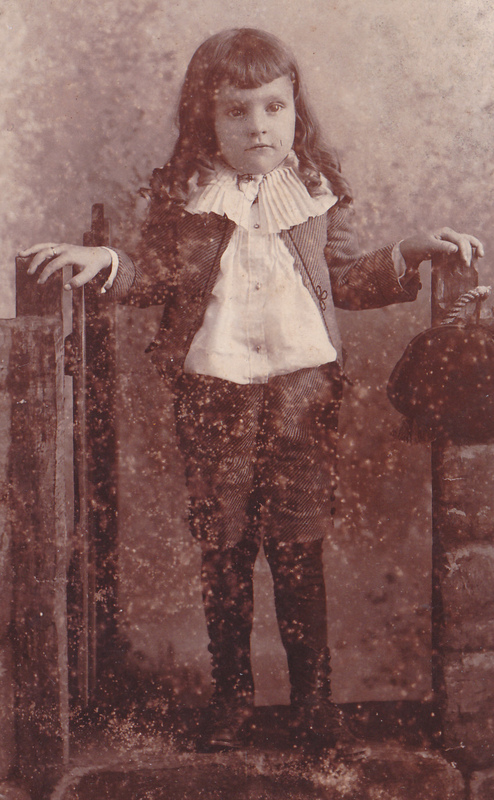 There is a Charles Baner Bussell in my family tree who would have been about the age of the boy in that photo. That’s wonderful, and quite possibly he! Would you like me to send you a scan(s)? yes, I’d love that. I haven’t found a reason for the Baner name yet. Look for it, I have finally remembered to sent it! I do not have an email for you; contact me off-blog with your address! Greetings. Intrigued by your article and would like some info about T. B. Blackshear Macon GA.. I have a picture with no inscription nor date of two gentlemen posing with a poodle on a table between them. The “backmark” I think it’s called has an emblem T. B. Blackshear. Where can I send a scan or picture of this picture to so that I may find out some background? Thank you. Note: Please respond to my email below. Yes, I have further info for you and would love to see the image. I will be in touch. Thanks for reading! I have a picture of my husband’s 2nd great-grandfather done by T.B. Blackshear and I was wondering when he operated his studio. Thank you. T. B. Blackshear worked in eight separate Georgia cities, so I am not sure which city you mean. He worked longest in Macon where he was 1873-1910, but he also traveled out from there from time to time to work in other cities for short times. Hope this helps. I will email you and you can send me questions.